Customer relationship management (CRM) deployments are most effective when they legitimately support all three words that make up the acronym itself. Customers of the modern business-to-business (B2B) enterprise benefit when they purchase goods and services from companies who are focused on the buyer’s experience. Internal relationships within the selling organization are more effectively maintained when all customer-facing stakeholders have access to the rich data contained in a well-maintained CRM. And the management of the enterprise providing solutions can run their business like a finely-tuned machine when the maximum levels of visibility into customers and accounts are clear and accurate. 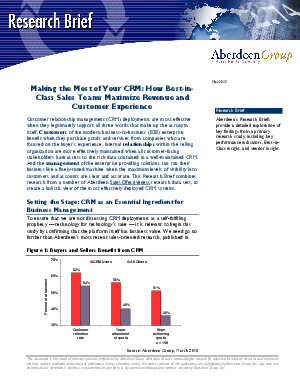 This Research Brief combines research from a number of Aberdeen Sales Effectiveness research data sets, to create a holistic view of the most effectively deployed CRM systems.